Let's make a DATE! As we are now settling into Fall, we thought what better food to spotlight than one that is a delicious showstopper for any holiday gathering. For this reason, we put on our entertaining caps and thought it would be the perfect time to share a holiday go-to – Sunsweet® Pitted Dates! They have a delicious taste, and this bite-sized fruit is packed with so many health benefits as well. Perfect! Sunsweet® Pitted Dates are more specifically referred to as Neglet Noor dates, which are semi-dry and known for their rich, honey-like sweetness. Some of their best features are that they are fat free, gluten free, rich in vitamin B6 and packed with 3 grams of fiber. Sunsweet® Pitted Dates are offered in 8 oz. resealable packaging or 10 oz. canisters that allow you to easily transport them. Perfect if staying at the in-laws and you know you want to whip up something easy and festive. As if that was not easy enough, Sunsweet® has made it even more convenient for consumers by offering these dates pitted. Of course, dates can be served raw and as is, or they can be paired with both a variety of savory and/or sweet ingredients. Some of these additional ingredients could include anything from cheese and nuts to chocolate and ice cream (yep! ), as well as meat. Talk about being able to appease anyone's discerning palate! As previously mentioned, Sunsweet® Pitted Dates are packed with amazing health benefits and are perfect for individuals who are also concerned about the nutrition of the foods that they're serving their family – or guests. Dates are a natural source of sweetness and sugar, as well as a good source of fiber and potassium. Sunsweet® is based in Yuba City, California, and known as “the world’s largest dried tree fruit processing plant, with the highest product quality standards anywhere.” That's a bold statement, and they back it up! Every day Sunsweet® produces 40,000 cases of products. This ambitious production rate would not be made possible without the support of 300+ grower members. Sunsweet® has 10 fruit drying systems strategically located close to crops. From there, the fruit is transported to a large processing center that is 1.2 million square feet in size. ENORMOUS! Sunsweet® dates are then pitted with the help of a computer-controlled Smart-Pitting System to almost flawlessly remove pits for consumers for ease and enjoyment. 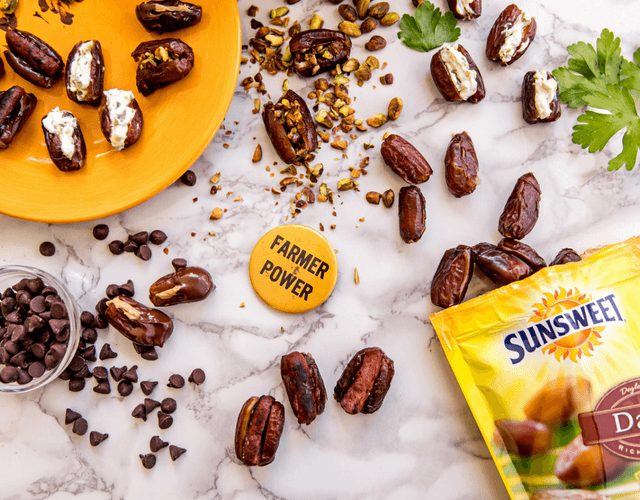 This year marks Sunsweet®’s 100 year anniversary, so we think that's even more of a reason to celebrate Sunsweet® and their delicious pitted dates! doug gerard said: "I love dates! More people should eat them. Perhaps they are not familiar with them but you can eat them as they are or use them in baking to make dessert bars, cookies, & cakes. I encourage you to try them ~ Doug Gerard". Stuffed Pitted Dates - Four Ways! 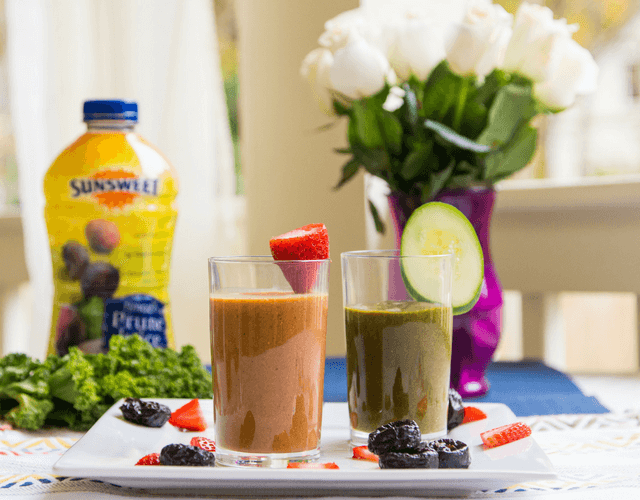 Amaz!n Prune Juice Smoothies - Two Ways!